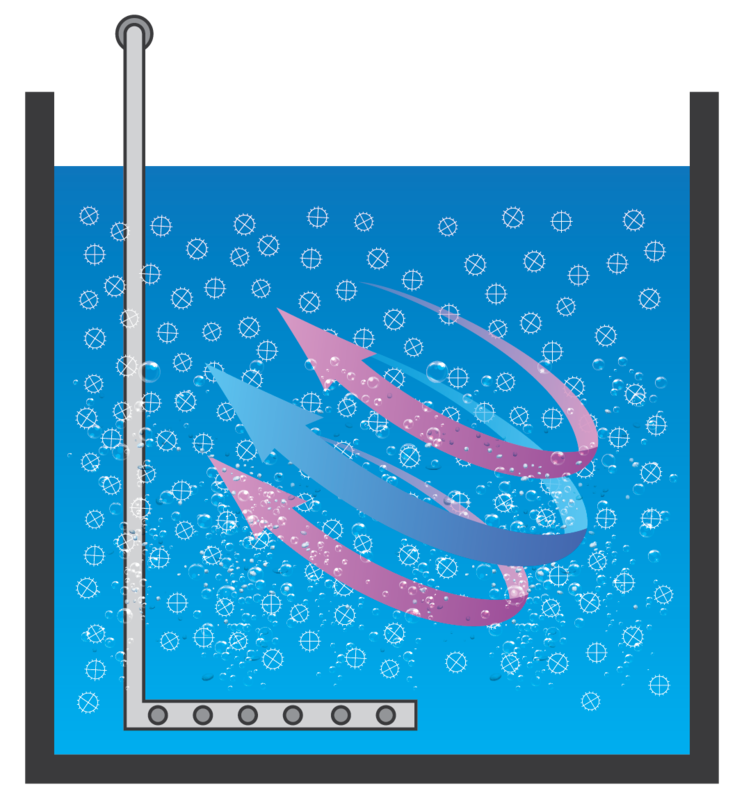 The Moving Bed Biofilm Reactor (MBBR), originally invented at the Norwegian University of Science and Technology, incorporates the combined benefits of Activated Sludge and Attached Growth wastewater treatment processes. RH2O® North America adopted and professionally tailored MBBR technology to guarantee performance in the unique Canadian climate and meet specific regulatory and project requirements. The core of the process is the specially designed biofilm carrier media made from High-Density Polyethylene (HDPE). The media provides a high surface area for optimal biofilm growth to treat the wastewater. The aeration system completely mixes the media inside the biological reactor providing access to oxygen. The media design and mixing process ensure that the media is self-cleaning, will not clog, and does not require replacement. Every RH2O® system is uniquely designed and tailored to the needs of each project. From new construction to retrofit or replacement of existing installations. Our systems are flexible and can be constructed from concrete, fiberglass, or polyethylene reducing capital investment using locally manufactured tanks. The benefits of our MBBR system can be used for upgrading or expanding existing wastewater treatment plants. From ammonia removal (nitrification) to assistance with high strength wastewater BOD removal, our system can be easily retrofitted in an economical package to help meet increasing regulatory standards. RH2O® Design Software provides process simulation and proactive troubleshooting to ensure each project performs to the most stringent of effluent requirements. Moving Bed Biofilm Reactor (MBBR) optimized to efficiently remove carbon and ammonia in the smallest footprint even at low wastewater temperatures. Self-cleaning media doesn’t clog or need replacement and is resilient against hydraulic and organic shock loads. Dissolved Oxygen (DO) Sensor simplifies aeration control to maintain consistent and optimal performance and reduce energy costs. Automated Aeration Control eliminates complexity of operation and reduces maintenance inspections. PLC Control System with remote monitoring provides industrial-grade automation with full monitoring and management of control equipment. Our systems can be designed as a complete stand-alone process or may be retrofitted/upgraded to assist other technologies meet performance requirements. The cloud server acts as a real-time, 24-7 virtual operator, proactively monitoring vital data collected from the control panel. Design as a complete stand-alone process or retrofitted/upgraded to assist other technologies meet performance requirements. Raw wastewater is delivered to the primary clarification stage (pretreatment). (Sludge Holding/Pretreatment) Retention and storage of primary and secondary sludge along with separation of fine particles. (MBBR BOD Removal) Removes organic compounds from wastewater. (MBBR Nitrification) Removes ammonia from wastewater. Separation of secondary sludge which is returned to the sludge holding/pretreatment stage. PLC Control system with remote monitoring provides operational control of mechanical components including pump(s), and blowers(s), etc. Gravity or pumped discharge of the treated wastewater into a subsurface discharge system or surface water outlet. Our systems are designed for ease of operation and maintenance. The automated control system provides instant notification to the maintenance provider and allows remote connect to the control panel via wireless connection. The self-cleaning media reduces the amount of maintenance visits and the control system provides assurance of 24/7 round the clock operation. Find out how we can design your commercial wastewater treatment solution.